• PLEASE READ THROUGH THE FAQ PAGE BEFORE CONTACTING US. Thank you and we hope you are enjoying your day. How much does a Nomad tiny home cost? Fully equipped tiny homes start at $59,500. Please visit our BUILDS page to see some more pricing. When would you be able to start my tiny home? We fill spots on a first come first serve basis with a deposit. Once contacting us we will let you know if there is an opening close to your timeframe. How long does it take to build my tiny home? What sizes do you build? 24 - 43 foot tiny homes. How wide are your tiny homes? They are 8.5' wide. If you would like to go with a 10' wide home you will have a couple different steps. You will need to find a tiny home trailer (or get one made), that we and NOAH approve of, get it delivered to us and cover all costs of the trailer, the permits and all fees to move the home to your site when completed. 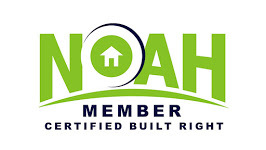 We are NOAH certified as of November 2017. What is NOAH (National Organization of Alternative Housing)? How do I get my tiny home delivered? We recommend hiring an insured delivery company. There are many sites to help you find communities, here are a few: Tiny House Community, The Tiny House. You can also contact local rv parks to see their rules on parking. You can also purchase land to park your home (make sure you can legally park it there first). What type of maintenance does my tiny home require? You do have to maintain your tiny home much like a regular home. Make sure you are maintaining your tiny home properly for the climate it will be park in. • WHY NOMAD TINY HOMES? - First and most importantly because we care, we put our hearts into our work & we understand this is your dream. We pride ourselves in our attention to detail and will treat your home as if it is ours. - We are NOAH certified as of November 2017. - We have a 3 month Warranty that covers your complete tiny home. - All of our trailers are professionally custom built by a local company in Texas, they are inspected to meet DOT standards and titled. They are also designed to give you the most interior space possible, still meeting regulation heights. - We have 10+ years building traditional homes prior to tiny homes. We now solely build tiny homes with a full time crew in our personal climate controlled warehouse. This means your home will stay dry and clean during the entire build process as well as stay on time because there are no weather delays. - Each one of our tiny homes is built custom to your needs. Your lifestyle needs are just as unique as you. - Lastly we understand tiny living. We have lived in a 32 foot bumper pull rv with our two children and have learned things that we wish all humans had a chance to, even if only for a few months. We also appreciate a well built energy efficient home being that an rv, let's just say, is not really known for that. Our life experiences are carried with us daily and impact each design choice we make.